Chinese tech firm ZTE has agreed to pay a $1.2 billion penalty for violating U.S. sanctions on Iran and North Korea. ZTE (ZTCOF) will enter a guilty plea in federal court, U.S. investigators said Tuesday. Executives at the firm had conspired to build telecommunications networks in Iran using equipment manufactured in the U.S., they said. The company is also accused of making 283 shipments of sensitive equipment, including routers, microprocessors and servers, to North Korea in violation of export rules. "We are putting the world on notice: the games are over," Commerce Secretary Wilbur Ross said in a statement. "Those who flout our economic sanctions and export control laws will not go unpunished -- they will suffer the harshest of consequences." 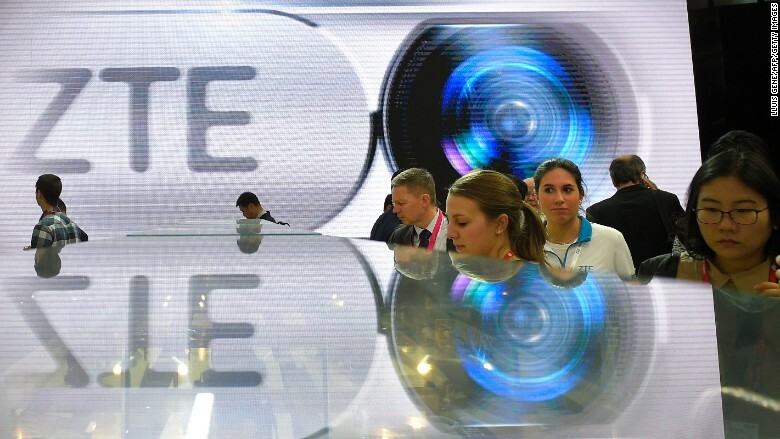 U.S. officials allege that ZTE's most senior executives were aware of the firm's activities in Iran, which were disclosed in a 2012 media report. Investigators said they were assured by ZTE executives following that report that the firm had stopped its operations in Iran, but the company surreptitiously resumed its dealings in the country the following year. ZTE overhauled its top management last year after the U.S. imposed export restrictions on the company. "ZTE acknowledges the mistakes it made, takes responsibility for them, and remains committed to positive change in the company," said CEO Zhao Xianming, who took over last April. The company has introduced new compliance procedures, he said in a statement. Investors welcomed the news that ZTE had reached a deal with U.S. authorities after months of uncertainty about the case. The company's shares climbed more than 6% in Hong Kong on Wednesday. ZTE produces smartphones for the U.S. market, but is best known for its telecommunications network components. The restrictions the U.S. imposed last year made it harder for ZTE to acquire U.S. components. The rules required suppliers to apply for an export license before shipping American-made equipment to the company.